All the kiddos around here are officially out of school for summer. (The good ol’ days…) This has me dreaming up what a summer vacation might be like. With the exception of a few weekend trips here and there, I don’t have any major vacation plans for the next few months. I’d settle for a trip to any of these three locales. (I included Harbour Island because I’ll be heading there over the Christmas holiday this year. Yes. That’s a whole six months from now, but it’s something to look forward to anyway!) While I always love a good beach trip, the scorching temperatures around here have me yearning for a trip to the mountains (hello, Aspen!). Are you headed anywhere fun this summer? I'm heading to canada next week so I'm totally channeling that Aspen look. LOVE it! Perfect packing for every location! I love all these combos! Perfectly tailored for each location. I'm especially diggin the hamptons vibe you've got going on. Okay, so I want to Summer in the Hamptons now! I'm headed to Colorado Springs to stay at the Broadmoor next week- the Aspen bit is perfect inspiration! Can't wait for the cool weather! I wish I could pin from your blog, I love this set! You have a very good eye for the details! great picks for each destination! I'll be heading to Walloon Lake in MI for the 4th! I love the outfits you put together, Hun! Love all of these looks! I'm studying in Rome for three weeks so I'll need a mix of outfits… all of these are fabulous! 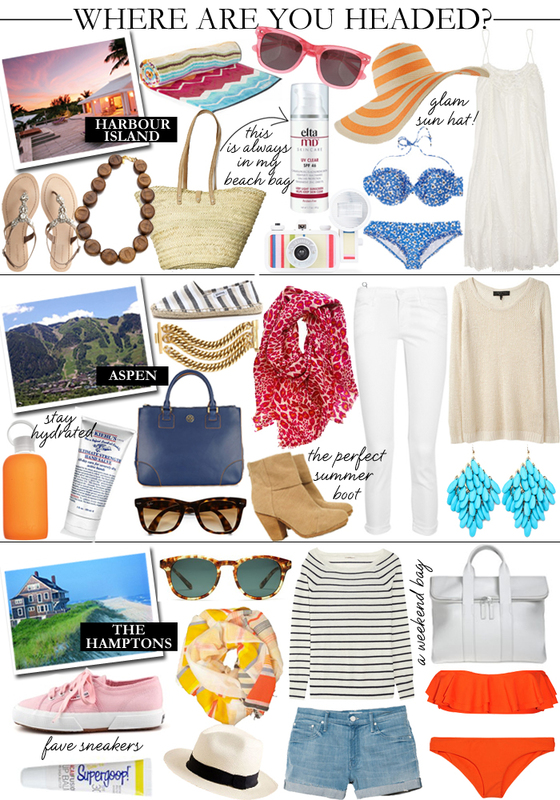 I love the Hamptons look, especially the Madewell Panama Hat. Too cute! Love your blog, nice work! This makes me want to go on a vacation!